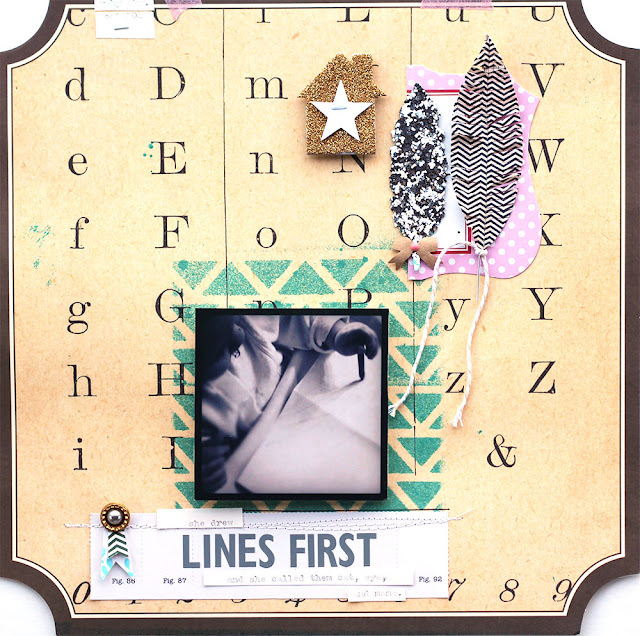 jbs inspiration: cuts! feathers and stars and more! cuts! feathers and stars and more! Hi everyone! 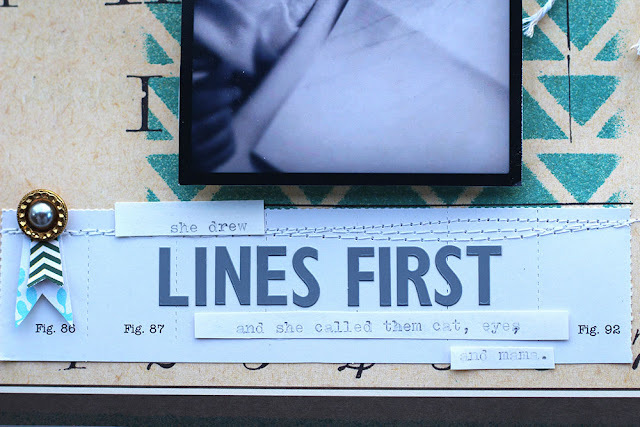 This is Ashley today, and I'm excited to share with you my first-ever pages using JBS cut files! Having recently received my first die cutting machine for Christmas from my mom -- a Silhouette Cameo -- I was super excited to finally get to use those awesome JBS digital cut files that come out each month! Awesome! 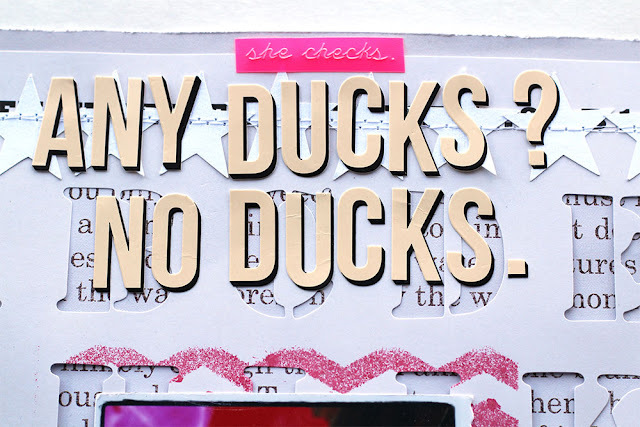 I was so excited, in fact, that I just couldn't stop cutting and made three layouts for this months' blog theme. 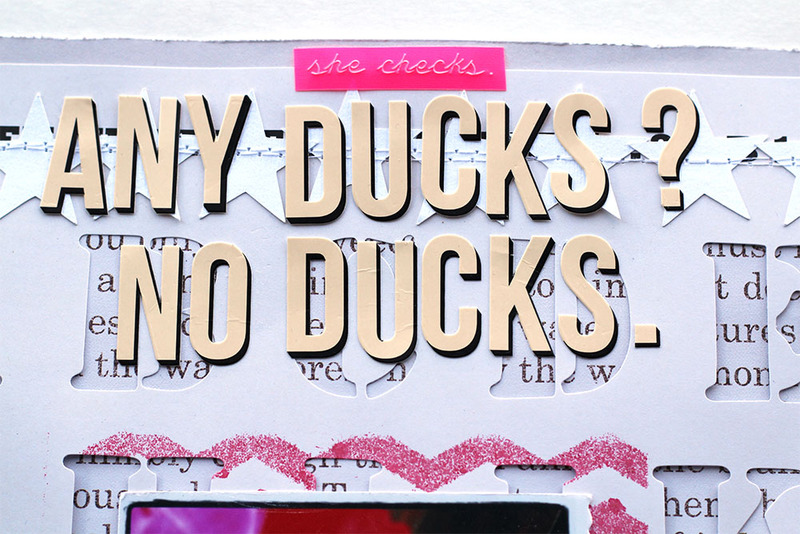 For my first page, Any Ducks? No Ducks. I used two different JBS cut files. 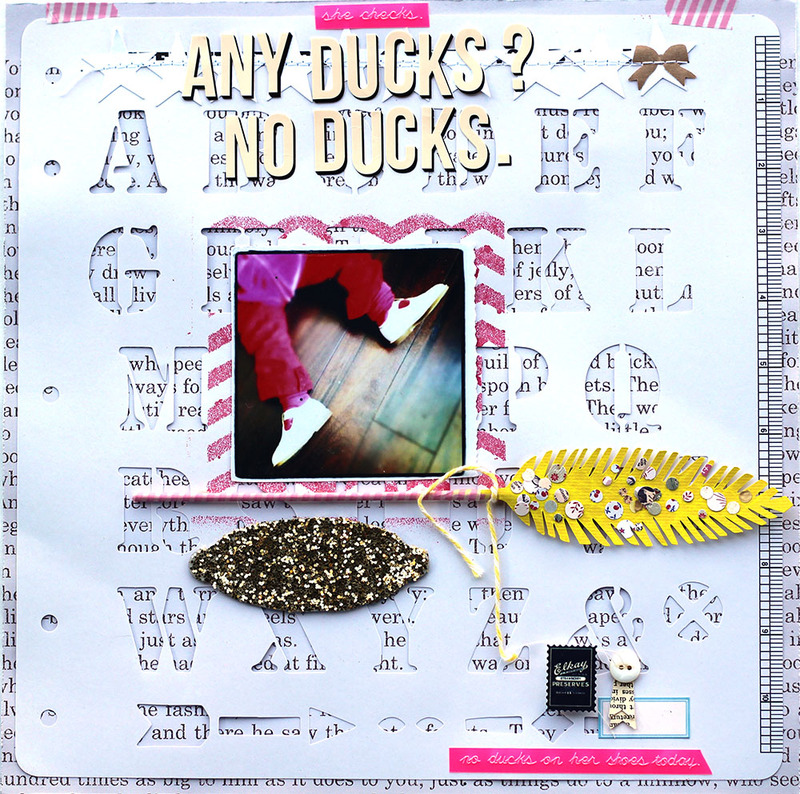 I used the stars from Backdrops 1 (JBS Mercantile November 2012 kit), and a feather from the January 2013 JBS Mercantile papercrafting kit. 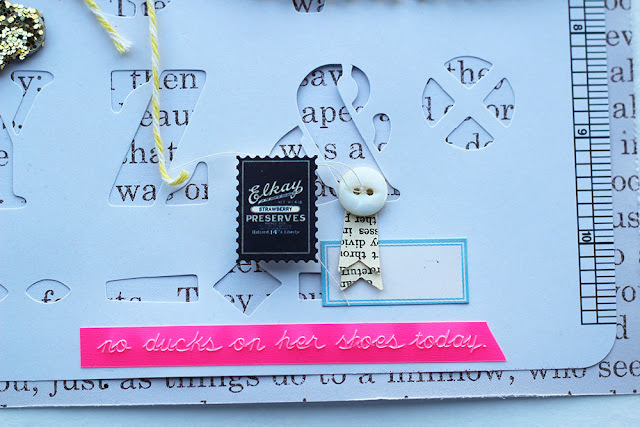 For the layout base, I layered the stencil die cut paper over a JBS text paper from my stash. If you don't have this same text paper (I stocked up because they are amongst my FAVES! 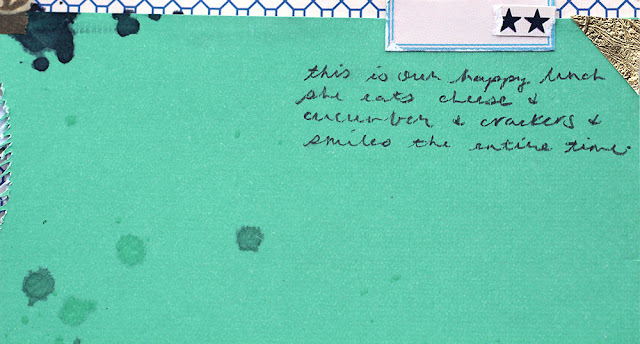 ), you could use a text paper like the b-side of Peeling Paper from Haven. 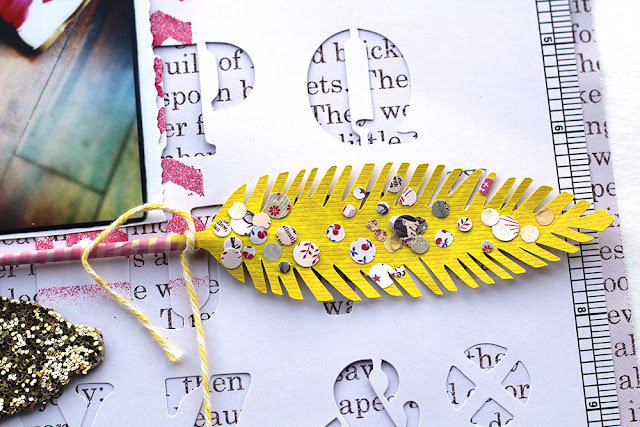 I cut one of the January JBS kit feathers from bright yellow cardstock, and then covered it with confetti collected from my JBS paper scraps. This was a fun and easy way to dress up a plain cut! 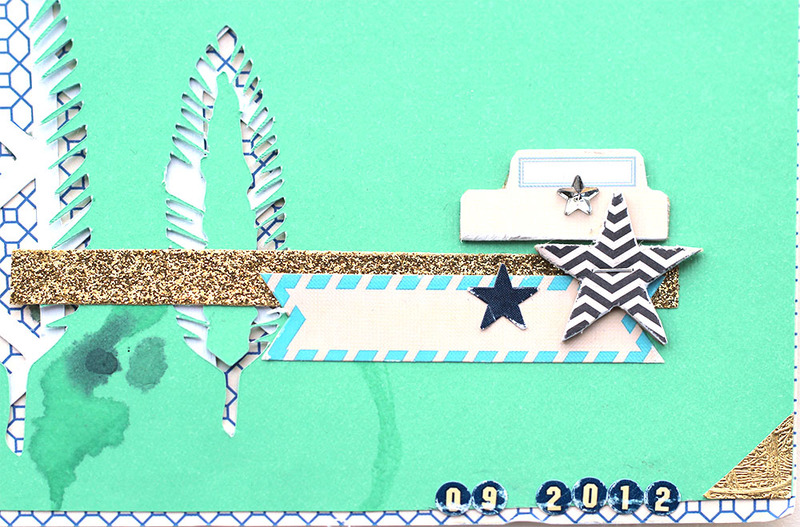 I layered an overlapping row of stars from the Backdrops star file across the top of the layout. 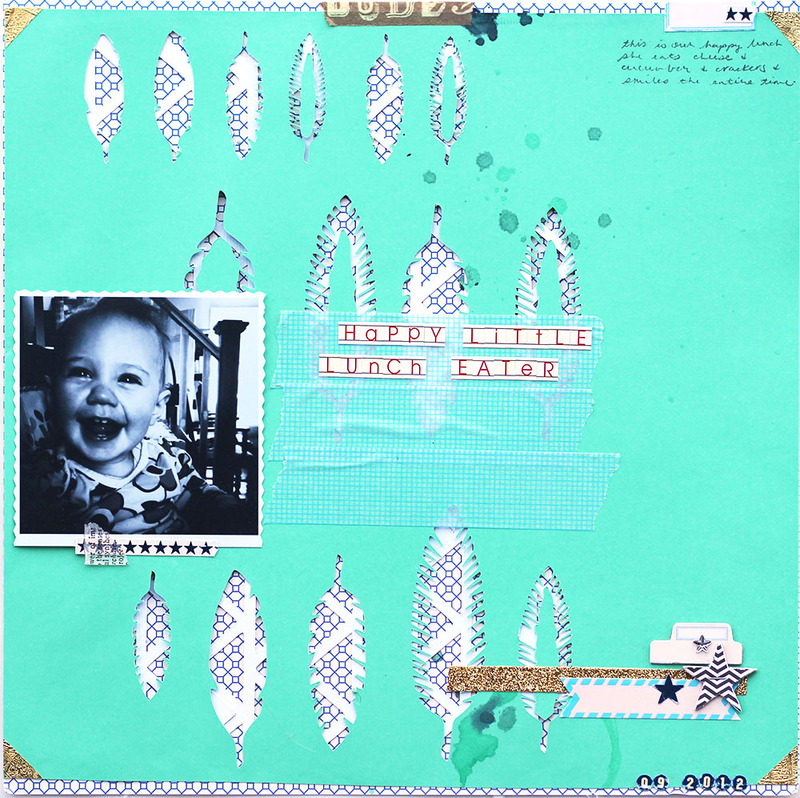 Supplies: stencil die cut paper; feather cut file; backdrops1 star cut file; General Store postage stickers; shadow alpha stickers vintage/black; Fiskars/Jenni Bowlin Blue Ribbon Large Squeeze Punch; true vintage buttons; chevron mask. For my next page below, happy little lunch eater, I layered two pieces of cut cardstock over a patterned paper background. 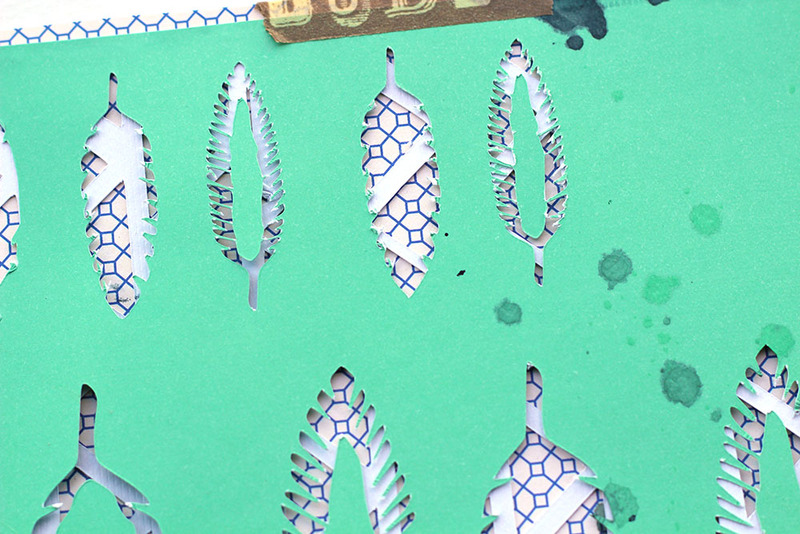 The top aqua cardstock has many sizes of different feather styles cut from the files included in the JBS Mercantile January 2013 Papercrafting kit. This cardstock was actually the first thing I attempted to cut with my brand new Cameo, and I loved the way it looked even though I had originally intended on using the feathers I cut out, I used this piece instead. Under the cut-feather cardstock is a sheet of white cardstock cut with the triangle pattern included in Backdrops1. I layered the two cut cardstocks over the backside of Typing Lessons paper from the Wren collection. I love these mini chalkboard stickers! 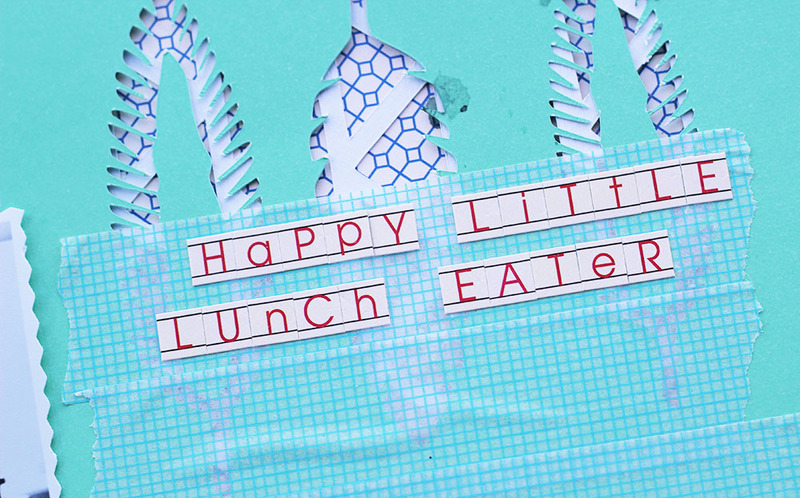 This combination of layered cut paper happened quite by accident. I was cleaning up a mess of papers, trying to make room on my desk so I could actually DO something, and I stacked the cut-feather cardstock over the triangle-cut cardstock and placed on the huge stack of JBS papers I keep on my desk at the ready. It was LOVE IT at first sight. The rest of the page just fell into place once I saw those papers layered up. In keeping with the blue/green base I had built with the cardstock and patterned paper background, I gathered together a bunch of favourite JBS products in blue. I used a chipboard file tab covered with a blue cardstock file tab Hodge Podge sticker; a blue Hear Ye Hear Ye banner, a blue star from an apothecary label sheet, and a chipboar star covered with chevron patterned paper. The rhinestone star added a nice little shiny touch to this embellishment cluster. I sanded, scratched, and scuffed up the round number stickers for the date. Supplies: Typing Lesson patterned paper; backdrops1 triangle cut file; JBS Mercantile January 2013 Papercrafting Kit feather cuts; mini chalkboard alpha stickers, red; mini chipboard pieces, tiny tab; mini chipboard pieces, stars; tiny circle cardstock alpha sticker, reverse navy; Hear Ye, Hear Ye banner stickers, candy stripe; blue label stickers; apothecary stickers, navy. 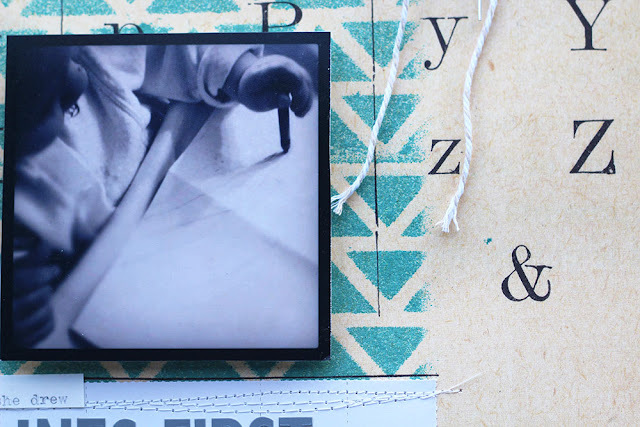 I started building the page on a piece of die cut label paper from the JBS Family Tree line. I love being able to use older papers from my stash! While I always scramble to buy the latest and greatest JBS products, I do also love how truly timeless they are! And I am really regretting that this is the last piece of this paper I owned! 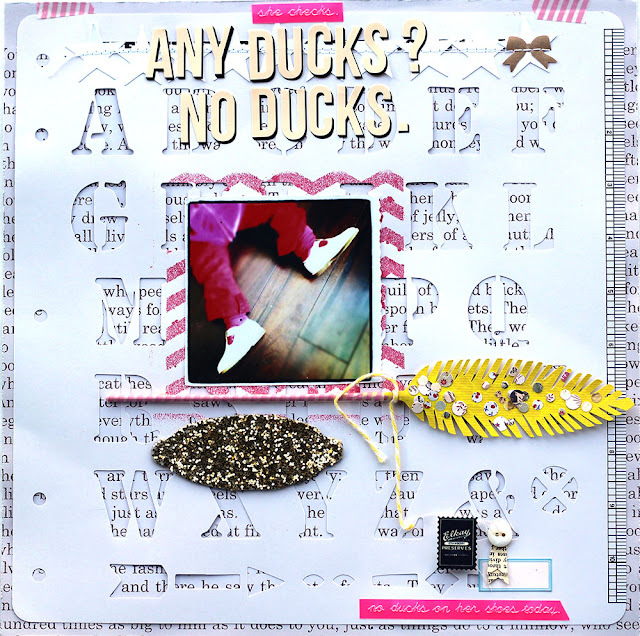 I added in a die cut label from the polka dot journalling card pad. 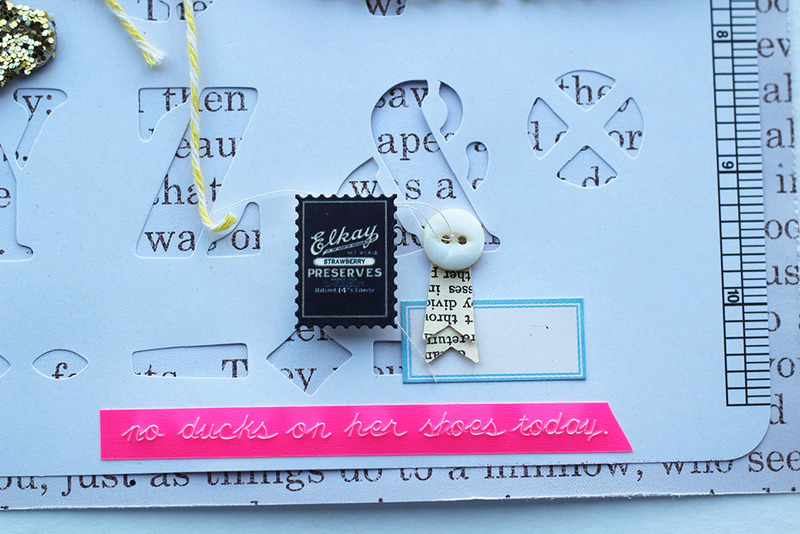 I also added in a little strip of die cut and perforated stamp paper to host the title. This is a fun and easy way to make your own glittered cuts! 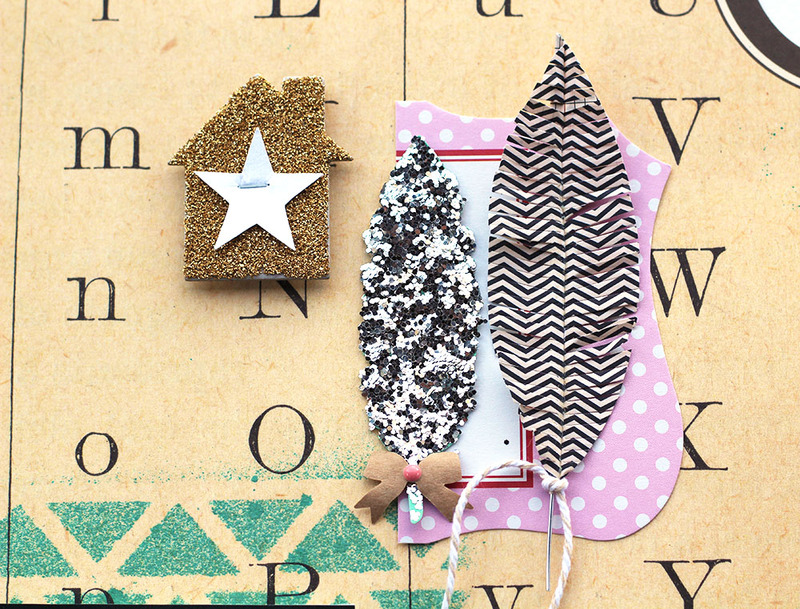 Just cut out the desired shape, then coat liberally with Mod Podge, and dunk into your favourite glitter. I paired the glittered feather cut with a JBS cardstock feather embellishment, and topped both off with little bows. The star on the house was an extra that didn't make it onto the Any Ducks? No Ducks. page above, cut from the Backdrops1 star pattern. Here is a closer look at the masked and misted triangles. Love the possibilities of being able to cut my own masks now! Supplies: feather cut file; triangle background cut file; star cut file; cardstock feathers; die cut and perforated papers, stamp; die cut journalling card pad, polka dot; Fiskars/Jenni Bowlin Blue Ribbon Large Squeeze punch; skinny alpha stickers, grey; true vintage buttons. Yes! to the feather queen and her LOs! so so very creative Ashley! Ashley! These pages are beyond inspiring. I love the cuts so so much. Digi Sale! Classic Labels = Classic JBS! Boy Meets Girl. Girl Meets DieCut Machine. Newsflash! May Reviews JBS at CHA! Family Tree is Here in Digital! Layers, Layers, and More Layers! Welcome to Our January Guest Jennifer Chapin!